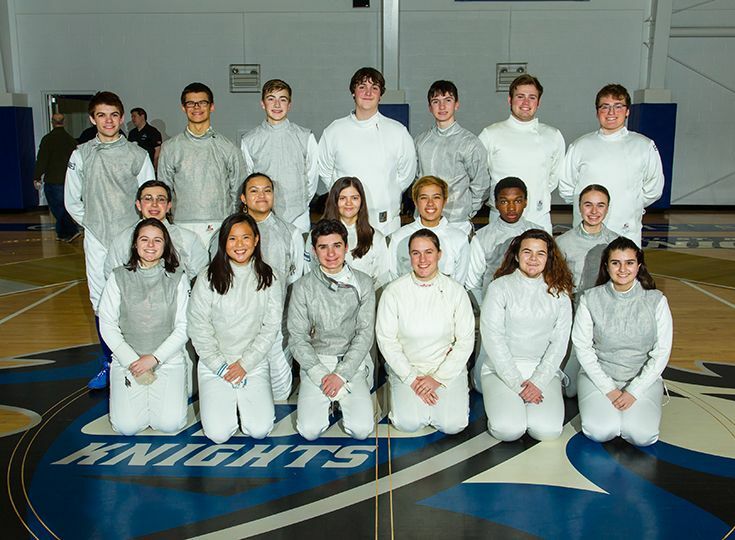 The boys’ and girls’ fencing teams enjoyed a tremendous amount of success this past winter, which according to head coach Joe Zanko, was multiple years in the making. The higher expectations definitely paid off for the squads. While both the boys and girls posted 3-8 records in the regular season, the meets served as great training opportunities for the important championship matches at the end of the season. The fencers started off the championship season on a high note by having a solid showing at the Freshman/Sophomore Tournament. Three fencers took home medals for Gill, including Caroline Solondz ‘21 as she took first overall in women’s saber. Also having great showings were Zoe O’Connor ‘21 who finished third in women’s epee and Zak Griffin ‘21 who grabbed third in men’s epee. The Knights kept up the momentum at the Prep Championships as the girls’ squad had solid performances in the team competitions as women's sabre placed first overall while women's epee took fifth and women's foil finished eighth. This helped the girls’ team claim fourth overall in the championship. The boys’ team also had a strong outing as men's sabre took sixth, men's epee finished seventh, and men’s foil placed eighth. Individually, O'Connor had the highest finish of the day, claiming second in epee and Brianna Moglianesi ‘19 and Solondz each took third in epee and sabre, respectively. The boys’ team meanwhile had a pair of top-five finishes as Barrett Reep ’19 took fourth in epee while Mark Rusas ‘19 finished fifth in sabre. One of the main highlights of the year was the girls’ sabre squad of Edie Brazil ‘19, Maggie Kistner ‘20 and Solondz as they finished as the fifth-ranked squad in the state. Also for the first time since Zanko had taken over the program, two fencers advanced to the NJSIAA state championship with Brianna Moglianesi ’19 finishing 11th overall in women’s epee after advancing to the second round and Alex DeRing ’19 claiming 18th place in men’s sabre.